Alley and Loading Berth Design Code Must Be Changed…It Simply Doesn’t Work! When developers propose new downtown high-rise towers, their plans routinely show inadequate, undersized, and even totally useless perpendicular to the alley, loading berths. Even though the design is clearly not functional, the developer says they "meet code", and the Design Review Board typically approves them without comment. If they do make a cursory comment, it’s usually along the lines of “this will be handled at SEPA”, which is a bald-faced lie. It will NOT be handled at SEPA, because at SEPA it is presumed that the basic building design has been approved and is satisfactory. 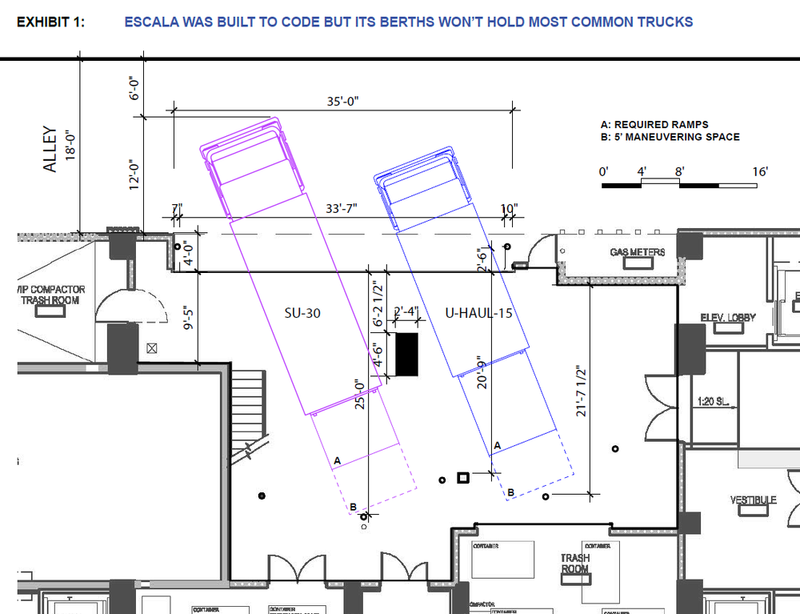 As shown in the cover photo and the two Exhibits, Escala’s loading berth was built to code, yet it won’t hold most common trucks. That’s why it’s imperative that we get action to improve Design Review procedures on loading design and alley circulation; and code revisions on loading requirements and alley width. Right now, at least 75% of their deliveries and move-ins and move-outs are serviced by trucks parked out in the alley. 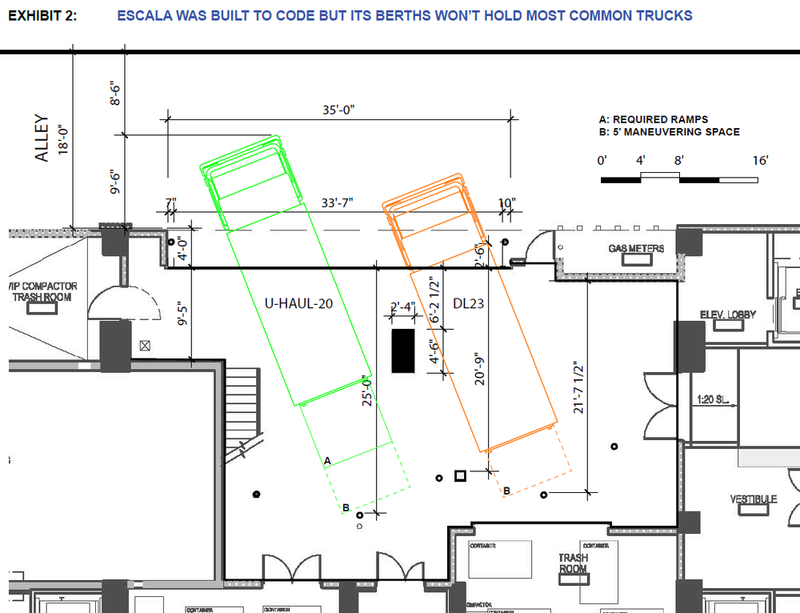 Now, to make matters worse, there is a 500’ tower proposed with its loading berths directly across the alley from Escala, and with the same loading berth issues (code compliant, but not self-contained). Imagine the total gridlock in this alley if this is allowed…a recipe for disaster. Alley Rage will be the norm! For several years, we have been lobbying incessantly on this issue. Finally, there appears to be some light at the end of the tunnel. According to Crystal Torres, Senior Land Use Planner, the "SDCI is participating in an interdepartmental working group, led by Seattle’s Department of Transportation, to understand current and expected future demands on alleys, including increased alley demand from residential development in our Center City and increased deliveries by truck, and to explore how City regulations might be modified to better accommodate these demands. As part of the 2018 Budget development process, the Seattle City Council adopted a Statement of Legislative Intent (SLI) that asked SDOT to identify tools to reduce alley congestion in downtown Seattle.” Money has also been approved in the 2019 City Budget for continuation of this work. 1. Compiling standard drawings for loading access that will be completed by year’s end and would begin to be used next spring. 2. By January/February, both SDOT and SDCI will issue Director’s Rules guiding each department’s approach to loading reviews for public comment. (These are being coordinated with SPU so that garbage and other utility concerns get incorporated.) They are expected to become final rules by March/April. 3. Clarification of the exceptions process for granting a waiver to code requirements that will require a more compelling case for an exception rather than a mere assertion from the developer. 4. Education for Design Review boards, city staff, architects and developers will follow, showing the expectations for loading design and its review. Longer-term actions over the next two years will focus on code revisions, including adding residential loading requirements, new requirements for storing dumpsters, guidance on locating parking access closer to the end of the alley, and greater alley width. This is all good news IF there is the promised follow through. This is where we need your help! Please contact the Mayor, City Council, and SDCI and SDOT Directors on this issue and emphasize that it is imperative the recommendations of the Interdepartmental Working Group be implemented on a timely basis, and the necessary alley code revisions be adopted as soon as possible. We won’t get a “do-over” for generations if the ball is dropped on these much needed and long overdue improvements. Why should downtown towers be exempt from transportation mitigation?